Southwest Women’s Health Associates (SWHA) is an independent, private health care practice, serving women in the Four Corners region of Colorado. In 1989, Nurse Practitioner, Karen Zink, founded the practice with the mission to deliver high quality, patient centered primary and gynecologic care to women throughout their lifespan. Nearly 30 years later, the SWHA team strives to address body, mind, and spirit – meeting women where they are and partnering with them to optimize health and wellbeing. contraception, nutrition and lifestyle counseling. Successes: Building a practice from the ground up mostly through word of mouth, limited advertising, and participation in community events such as the 9Health Fair, is a testament to the quality of care provided by SWHA. Patient referrals are the most important measure of success to the SWHA staff as it reflects the connection they are able to make with their patients and the satisfaction level of those they serve. Every staff member has a stake in the practice and all believe that the most rewarding parts of their job is keeping their patient populations healthy by reversing and preventing disease. Challenges: At the beginning, SWHA experienced opposition from some of the medical community because they were a nurse practitioner owned and operated practice. The community soon realized the high level of care provided by the practice and now many local physicians and business professionals are patients. In addition, when electronic health records (EHR) became a requirement, nurse practitioners were not eligible for federal funding to acquire a suitable platform. SWHA had to save money and be strategic with their purchase when selecting an EHR to meet their needs and those of their patients. Finally, in the primary care fee-for-service model, reimbursements are modest and it took the practice about 20 years to be debt free and achieve financial stability. Succession plans for the practice are underway, with Zink intending to gift SWHA to women who will continue to further its mission. 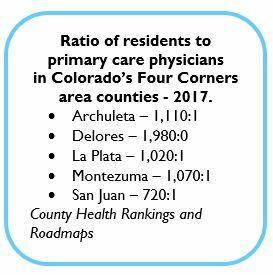 Impact: Operating a sustainable, patient-centered women’s health practice serving 4,500 women is SWHA’s way of serving Colorado. Every day, the staff works to positively impact the health status of their patient population in such a way that disease is prevented, reversed, or at least well managed. Their goal is to have patients leave the visit feeling knowledgeable and empowered to care for themselves and their loved ones. Karen Zink would like to express her gratitude for the privilege to operate the practice of her dreams and to be surrounded by women who will carry its mission into the future. She would also like to acknowledge that the practice would not have been possible without the support of her husband, Jerry.